Avignon is one of the major cities of Provence, in Southern France. It is the main city of the département of Vaucluse, and is on the banks of the Rhône river. Avignon was one of the European Cities of Culture in 2000. Avignon is famous as it is the city to which the Popes fled when leaving the corruption of Rome in the 14th century. The palace they built, 'Le Palais des Papes,' or the palace of popes, is the world's largest Gothic edifice. 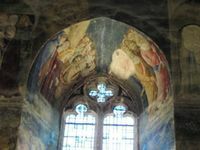 It was largely emptied over the centuries, and its vast stone rooms are filled with little more than old frescos, but it is still an imposing building. The Ramparts themselves were erected to keep the plague and invaders out during the turbulent middle ages, when Avignon belonged to the papacy and not the French crown. Its early history is much older than the popes, however. Avignon occupies a strategic location for several reasons - it is at the confluence of two once-mighty rivers: the Rhône, still one of the biggest rivers in France, and the now largely-dammed Durance. Both were important routes of trade and communication even in prehistoric times. In addition, there is a long island in the Rhone that made it possible to ferry people and goods across, and later bridge the river, more easily than in other places. It is estimated that about 200,000 people live in Avignon, 16,000 of which live 'intra-muros,' or within the ramparts built in the 14th century. The city is now sprinkled with buildings and monuments ranging from the new to the old, the very old, and the ageless. Avignon has been continuously inhabited since the stone age, when troglodyte inhabitations were built in caves in the Rocher des Dames, a massive outcropping of rock rising over the banks of the Rhône. Today, a public park with benches, views over the surrounding countryside, a café and playground is on top of the Rocher. The Romans had a presence in Avignon, though the walls they built lie buried somewhere under the modern streets. Vestiges of the forum can still be seen, lying unassumingly near the Rue Racine and the Rue Saint-Etienne, to the west of the city. Then, in medieval times, the town grew to an important center of communication and trade. The stone bridge spanning the Rhone was one of only three between the Mediterranean and Lyon. It was undoubtedly for its strategic location and ease of travel that it was chosen by the papacy as home within the then kingdom of Provence. The presence of the papacy made Avignon into a city of great political and economic activity. The old city wall, now visible only as a street that circles the very center of the town (changing names 5 times in the process!) was much too small and a larger wall, still visible today, was necessary to protect its bulging population. Wealthy Cardinals built extravagant palaces known as livrées both within Avignon and across the river, in Villeneuve-lès-Avignon. The city teemed with activity and building as architects, builders, artists flocked to the town. At that time, within the city walls there were over 100 churches and chapels - many of which have been transformed since then into everything from shops to a movie theater! The wealth and activity generated by the presence of the papacy spilled out into the region, so that even small villages nearby boast a rich architectural past. Cityjet  and Flybe  operate flights from the United Kingdom to Avignon Airport . Avignon lies on the TGV  line from Paris to Marseille, about two hours from Paris, Gare de Lyon. It is also served by numerous local and regional services. Local and regional trains call at the central station, outside the walls on the southern edge of the old town. TGVs call at Avignon TGV, about 2km out of town. A train runs from Gare Centrale to Gare TGV and costs €1.60 (August 2014), it takes 6 minutes. A weekly Eurostar service from London St. Pancras International to Avignon operates every Saturday in the summer. The journey takes approximately 6 hours. A map of the city, lists of hotels in all price ranges, restaurants, ideas for nightlife, and daytrips to the surrounding countryside can be found at the Office de Tourisme, 41 cours Jean Jaures (in the main street, which begins just inside the walls across from the regular train station). The city itself is small, and all sites are easily walkable. 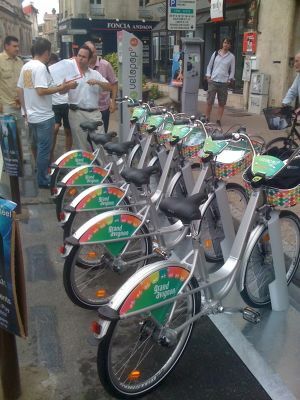 An automatic bike sharing scheme called Vélopop' allows you to ride along. Smartcard needed. A popular tourist destination is the Place du Palais, just next to the Place de L'horloge, though the casual tourist may find these places shockingly expensive, and flooded during the summer months with tourists. Within a short distance in just about any direction are the smaller squares frequented by the locals, and much lower prices. Recommended is the Place Pie, with its covered market (open 6AM to 1PM everyday) which sells fresh produce, cheeses, wines, and produits du pays. Le Pont Saint-Benezet is a ruined bridge not far from the Palais des Papes. The bridge was built in the Middle Ages - before the arrival of the Papacy - perhaps partly to allow the local bishop to cross the river to Villeneuve-lès-Avignon, where the church authorities had installed themselves because of Avignon's then-infamous dirt and lawlessness. The legend of the bridge's building is that a local shepherd, Benezet (a dialect form of Benedict) was inspired by angels to build a bridge. When his appeals to the town authorities proved fruitless, he picked up a vast block of stone and hurled it into the river, to be the bridge's foundation stone. Convinced by this demonstration of divine will, the bridge was swiftly built. The poor shepherd boy was canonised, and his chapel remains on the surviving portion of the bridge. If the bridge was divinely inspired, the Deity must have quickly changed his mind, because before long the bridge became unsafe and, following numerous floods, mostly derelict. Originally, the bridge had 22 arches, reaching across to the tower of Philippe le Bel via the mid-stream île de la Barthelasse. Only 4 of the 22 arches now remain. A multilingual audio tour of the bridge explains some of the local history. The well-known song "Sur Le Pont D'Avignon " (on the bridge at Avignon) refers to the bridge. The bridge itself is far too narrow for dancing or festivals - the original text of the song was "Sous (under) le pont d'Avignon", referring to the festivals and entertainments staged on the île de la Barthelasse. The current version was popularised by a 19th century operetta, whose librettist clearly assumed that 'sous le pont d'Avignon' would have meant in the river. Avignon has its share of museums, ranging from Modern Art Museums to museums housing artifacts from the Roman and pre-Roman days. If you are confident about biking, there are a lot of places to bike to. Boat trips on the river Rhone for a few hours or days for longer cruises are available. Theatre Festival Avignon is famous the world over for its annual theatre festival . For three or four weeks in July the city is virtually swollen with street performers, actors, musicians, and of course the ubiquitous tourists. The festival is an excuse to turn any room with enough seating into a 'salle de spectacle' and the city is host to a wide variety of entertainment. The gem of this festival are the performances which take place inside the Pope's Palace itself. Tickets are expensive, but this is considered by many French and European thespians to be a crowning achievement of a career. The vast majority of performances are, of course, in French but a number of foreign companies perform in (eg) English. Even without attending any events, the atmosphere and street theatre give the city a marvellous feeling. The International Congress Center  was created in 1976 within the outstanding premises of the Palace of the Popes and hosts many events throughout the entire year. Cinéma Utopia  This is not a massive 10-screen commercial cinema as any regular metropolis City Mall has, this is a century old French place. One of the most remarkable characteristics about it is the totally exquisite building itself, their XVII century paintings, wooden stairs and the awesome "La Manutention", a nice and cozy "petit resto" next door, a nice choice for couples. Tickets are sold just a few minutes before the functions, so you'll have to queue for the function. 6,50€ regular fare, under 14 4€. Flea Market. Every Sunday morning at Place des Carmes, browse the tables looking for your hidden treasure. Food Market. Every day except Monday, in Les Halles d'Avignon. Local specialties like olive oil, tapenade, local wines, cheeses, and pastries can be found at the market along with fresh local produce. Cooking classes are available on Saturday mornings. Restaurant l'Orangerie, Place Jerusalem. (A few minutes walk from the tourist-centre Place de l'Horloge). This is a small restaurant and the style is Provencal/Corsican. In Summer it has tables on the Square, the rest of the year it has four tables and bar on the ground floor and a few more upstairs. Terre de Saveur, 1 rue Saint Michel, (Just south of Places des Corps Saints). Mixed vegetarian and meat menu using fresh local ingredients to produce food highlighting Mediterranean flavours. Main dishes with meat, €14.50, without €13.50. Starters at €8.50 and desserts €6.50. Sit outside on the terrace, or inside in the dining room. They also sell locally made jams and tapenades. Restaurant Christian Etienne  - a well known Provence chef, his restaurant is right next to the Palais des Papes. An excellent vegetarian menu is available. Auberge-Camping Bagatelle Ile de la Barthelasse. This Hotel/ Hostel and Camp Site is situated on Ile de la Bathelasse in the centre of the Rhone . This is perhaps the best place to stay on a budget. It has great facilities and offers perhaps the best view of the center of Avignon. Carries a basic menu restaurant. Another benefit is that is placed directly between Avignon and the opposite town Villeneuve-les-Avignon, both begin within 10 minutes walk. Cost €16.56 with complimentary breakfast. Hotel d'Angleterre 29 Boulevard Raspail (10 minute walk from bus and train station). €40, some rooms with bathroom. Small hotel located within the city walls. Has a small private car park. Its use is free of charge if you can find a place for your car. Hotel Danieli  Rue de la République, very centrally with air conditioning and a good breakfast. €80 per night for a double during the summer, more expensive during the Festival d'Avignon. La Mirande Hotel 4, place de la Mirande €400 and up. 5 star hotel housed in a 700 year old converted townhouse. Be wary of anyone around the Palais des Papes area (or anywhere else in Avignon) who tries to get you to sign a supposed petition. They also attempt to accost you just when you leave the Palais des Papes and claim to be working for the Palais des Papes or other authorities in Avignon. This is untrue. If you sign their petition, they will demand money from you. If you encounter any of these people, ignore them or say 'non' and keep walking. Le Pont du Gard : this spectacular three-level stone ancient Roman aqueduct bridge is one of the greatest and best preserved pieces of Roman architecture in France. Take the A15 "Edgard" bus, which, after the renovation, again leaves from Gare Routiere. Alternately, catch a taxi from the SNCF station for around 50 Euros. If you just plan on seeing the Pont du Gard, you should be able to walk right in without buying a ticket as the ticket just gets you into the other exhibits. There is no ticket check as you approach the bridge from many of the hiking paths. Les Baux-de-Provence: listed as one of the most beautiful villages in France, standing on a spur of rock in the heart of the Alpilles, this village dominates Arles and the Camargue and offers and exceptional panorama. Superb medieval stone fortress. Gordes: lovely village perched on a rock, facing the Luberon mountains, Gordes has been classified as one of the most beautiful villages of France. Narrow cobbled streets and magnificent castle whispering the tales of a thousand legends. Roussillon : classified as one of the most beautiful villages of France, facing the Luberon Mountains, Roussillon is famous for its magnificent red cliffs and ochre quarries. Fontaine-de-Vaucluse : located in a valley, at the foot of the Vaucluse Moutains, encircled by a tremendous erosion-sculpted cliff, this village owes its fame to its spring which is the largest in France. The spring is also the source of one of the most beautiful river in the department, the Sorgue River. Saint-Rémy-de-Provence : located at the heart of the Alpilles, this typical Provencal village, built on one of the oldest Roman city, has inspired many artists, including Van Gogh. Arles : this town which has a history of 2500 years, is also known as “Gaul’s Little Rome”. It has some impressive Roman monuments, of which its famous arena. Arles is also the first city which Van Gogh discovered when he settled in South France in search of this light so unique to the South. This page was last edited on 25 September 2018, at 09:25.